Vireveri Darethran is a Dunmer hunter who wanders around Ald Velothi. 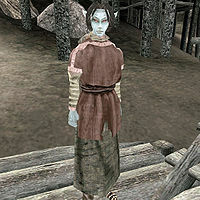 She is a sleeper for the Sixth House and if spotted at night, will greet you with a message from Dagoth Ur. If you slay Dagoth Draven in Subdun, she will awaken from her trance. Ask her about "Sixth House" and you will earn a point of Reputation. She wears a common shirt, skirt, pants, and shoes. She carries a leveled short blade. Aside from her natural resistance to fire and the sanctuary provided by her ancestors, she knows no spells. This page was last modified on 28 October 2017, at 17:33.